Plus keep in mind Kuchar already confirmed he didnt get $3K or 10%. The caddie reportedly made twice his usual salary for being on the bag. 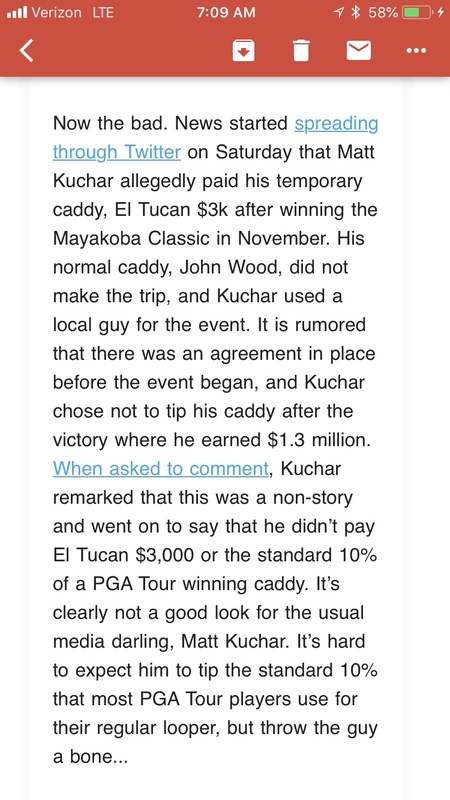 I don't think we will ever know the real amount and I question the $3k, however I am ok with whatever Kuchar wanted to pay. This was not his regular full time guy who is with him week in, week out making a cut or not. The guys who get the much bantered "10%" cut, get that for the body of work, not for being on the bag one week. The other part.. Do we even know if the caddie speaks english? Whether there was actual caddying done? I'm not going to judge without facts, and Kuchar has been a Statesman of golf for long enough that he gets the benefit of the doubt. So what he said was he DIDNT pay the guy 3k or 10%.. if you want to look at it literally he could have paid him anything (2k, 4k, 15k, $129,999, etc).. he probably doesn't want to disclose the amount so people don't go try n mooch off the guy, or taxes for him, who knows. It won't affect me regardless of if the caddie got paid 3k, 10%, or something in between. It's just another business transaction between employer and employee, and I am fine not knowing the terms. I enjoy watching him play, this won't change that opinion. This is EXACTLY where I'm at. Media are lazy now, so if they can use/create drama, they pounce. I am sure the caddie walked away with more than 3k. Beyond that, it's none of my business. Weird to throw a guy like Kuch under the bus. You're not going to go very far with that narrative. I feel the same way. It's a non-story. Twitter isn't journalism. And I don't care. Posting this in all the threads huh? Great story! Kuch is the man. If true, my opinion on him changes a lot! Why is that? Because he's frugal with his own money? It is totally between the 2 of them. They must have had an agreement, they both stood by it. Could he have done more, probably yes but it is what it is. At least he didn't totally stiff the guy. The part that stuck out to me is tour pros saying the Kuch stiffing someone doesn’t surprise them at all. No way to corroborate the info, but that was a weird take. I was watching Kuch warm up in the putting area at the Sony event a few years ago. Even though it states not to bug the players Kuch was the ONLY one signing autographs for adults and kids. I got the impression that he was a solid guy and I think he’s liked for that reason. I don’t know the details with the caddie and honestly I wouldn’t be surprised if he’s not talking about it for the safety of the caddie but I take social media for what it is, which is merely opinions and not necessarily accurate.